Asthma Awareness Silicone bracelet is a great way to show your support and raise awareness about Asthma. Thousands in stock. Will ship today. They are standard 8" adult size bracelets, and also available in a 7" youth size. Choose from the drop-down before adding to card. 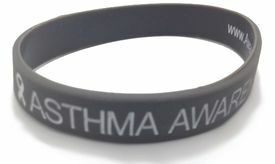 These rubber bracelets are gray for Asthma awareness and debossed with the words "Asthma Awareness" on them. Great for fundraisers! Comes in most colors. If you'd like a custom bracelet, please click on the custom bracelet button.